The siddur, Aḅodath Yisrael was first prepared for Temple Oheb Shalom (Baltimore, Maryland) by Rabbi Benjamin Szold (1829-1902). Before Szold’s arrival in 1859, the congregation had adopted for use in its Shabbat service the Minhag America by the Reform rabbi, Isaac Meyer Wise. After much discussion with his congregation Szold introduced Aḅodath Yisrael, which hewed more closely to traditional Ashkenazi custom. The first edition of this prayer-book appeared in 1863 with German translation, and was widely adopted by congregations in the United States. New editions were published in 1864 and 1865 (the latter with English translation), and another, revised edition in 1871, by Rabbis Marcus Jastrow of Philadelphia (1829-1903) and Henry Hochheimer of Baltimore (1818-1912). The edition we have imaged and made available here is the 2nd revised edition from 1873 which Marcus Jastrow prepared for his Philadelphia congregation, Rodef-Shalom. The siddur was first published in one volume. The 1885 printing of the 2nd revised edition of 1873 separates the contents of Aḅodath Yisrael into two volumes, the first containing Sabbath, Festival, and Weekday prayers, and the second volume containing the High Holiday services. A supplemental section, Songs and Prayers and Meditations appended to the first volume. Appearing at the end of the first volume, in the Appendix, there is a chart providing the Torah portions according to the Tri-Annual cycle. Making digital images of these works available is the first step in our process of making the entire prayerbook, both Hebrew liturgy and English translation, machine-readable (copy-pastable and searchable). If you would like to take part in the transcription of this work, please join our opensiddur-tech discussion group. “סידור עבודת ישראל | Siddur Aḅodath Yisrael, 2nd revised edition (1873) arranged by R’ Benjamin Szold and translated by R’ Marcus Jastrow” is shared by Aharon N. Varady (transcription) with a Creative Commons Public Domain Dedication 1.0 Universal license. Marcus Jastrow (June 5, 1829, Rogoźno – October 13, 1903) was a Polish-born American Talmudic scholar, most famously known for his authorship of the popular and comprehensive A Dictionary of the Targumim, Talmud Babli, Talmud Yerushalmi and Midrashic Literature. 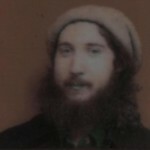 He was also a progressive, early reformist rabbi in America. Along with Benjamin Szold and Frederick de Sola Mendes, Marcus Jastrow was characterized by Jewish historian Jacob Rader Marcus as being on the right-wing of early American Reform. 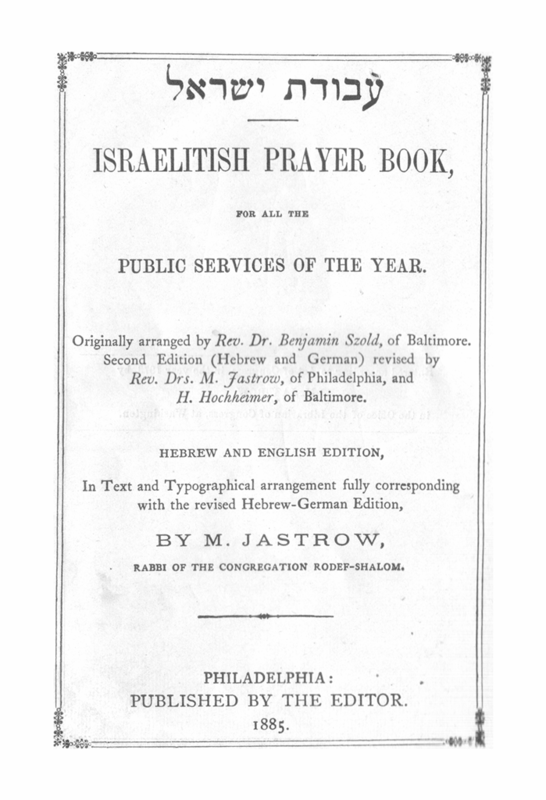 His translation of Rabbi Benjamin Szold's prayerbook into English offered a more traditional alternative to the Minhag America prayerbook of Isaac M. Wise. He opposed the 1885 Pittsburgh Platform, but consented for an organ to be installed in his Rodeph Shalom synagogue in Philadelphia. Please reciprocate for any adaptation or redistribution of this work by (1) properly attributing the work to Aharon N. Varady (transcription), Benjamin Szold and Marcus Jastrow, (2) clearly indicating the date you accessed the resource and whether any changes have been made (and if so, please be in touch with us and leave a comment below so that we might note your adaptation or improvement), (3) providing a link back to this source, and (4) specifying the Creative Commons Zero (CC 0) Universal license a Public Domain dedication under which this work was shared.